WarHeads are sour boiled lollies with individual wrapping. Purchase in a 20 piece pack or 240 piece bulk container. There are 5 flavours being watermelon, blue raspberry, lemon, black cherry and green apple. The 20 piece pack will be a selection of all 5 flavours, 4 of each, unless there are flavours unavailable. The 240 piece container is a pre wrapped tub and selection of flavours is predetermined and cannot be changed. 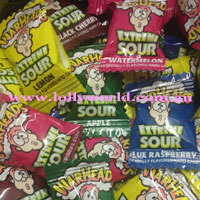 Need extreme sour then try WarHeads today.